Bathroom Humour: From Taboo to Tactical — MAD STRATEGIES Inc.
Not too long ago, when a lady would need to go to the bathroom, she would shyly excuse herself to “powder her nose”. Because even though everyone’s doing it, what happened behind closed doors in the bathroom was viewed as intimate and never to be mentioned. Times have changed. So, rather than skirting around the perfectly natural side-effects of being human, companies are embracing these previously unmentionables with full-force. 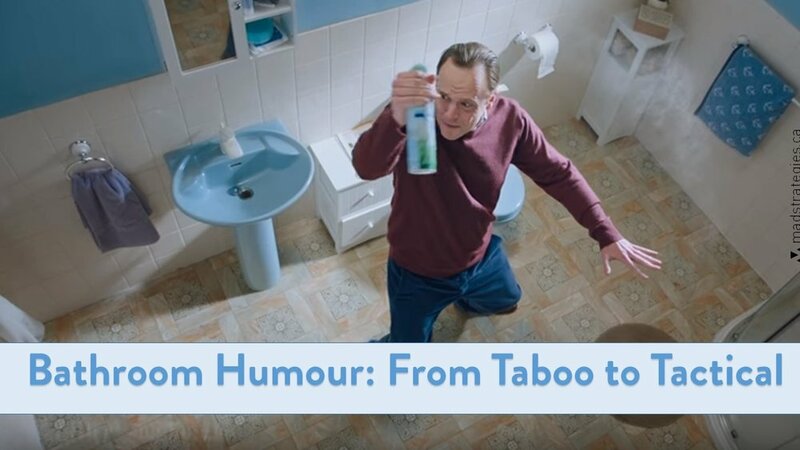 Take for example Febreze’s witty commercial. Their product is meant to deodorize and there’s no better place for it to excel at its purpose than in a freshly visited bathroom. Forget last night’s smell of cooked meatloaf in the kitchen, Febreze is ready for the heavy-duty combat. It’s reminiscent of PooPourri’s no holds barred campaign from a few years back. At least a deodorizer can be repositioned for another room with somewhat believable success. But PooPourri was only developed for one thing – there isn’t an alternative use to highlight. And, rightfully so, their advertising department jumped right in. So, how does a marketer scale back the crudeness? As with most things, humour tempers the harsh. It’s best to avoid gratuitous vulgarity altogether. That will appeal to only a few. Laughter, however, is always welcome. The comedic approach, especially one which is directed at something crass yet harmless, is sure to mitigate the awkward. Everybody poops. It never smells great. These and other products were created to improve the surrounding atmosphere when (not if) that happens. It would be a shame if instead of being able to market their functions and benefits, companies had to pretend with fluffy white cats in wicker baskets, and hope that consumers figure it out on their own. As a society, that’s just not who we are anymore. Point to the point, fearlessly, and advertise with chutzpah.